The Daytona Tortugas needed somebody to give their bullpen a break in the second game of Wednesday's doubleheader. Tony Santillan was the man for the job. Cincinnati's No. 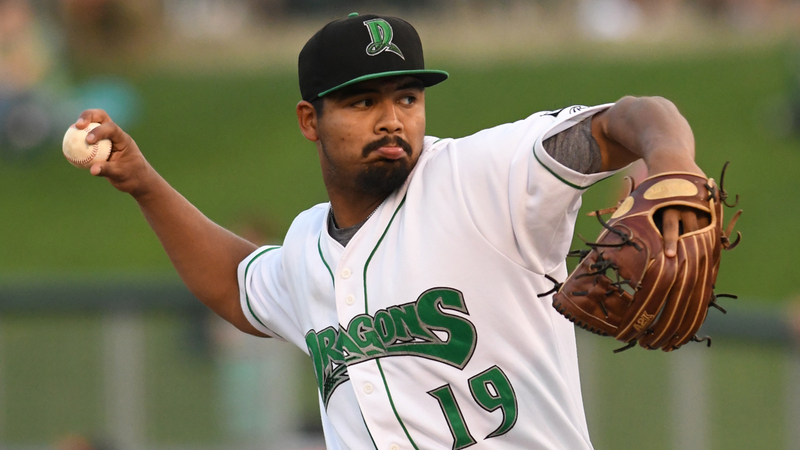 5 prospect allowed just one hit and struck out eight over six scoreless innings as Class A Advanced Daytona swept Charlotte with a 2-0 win in the nightcap. "He just had everything, all his pitches going, and he pounded the strike zone," Tortugas manager Ricky Gutierrez said. "He was really aggressive in making those guys go up there and swing the bat. He just had a great night." Santillan went four innings in his season debut April 5 and was charged with one unearned run on four hits against Florida. Against Charlotte, he was far sharper. The right-hander surrendered his only hit in the top of the third inning when the Stone Crabs' Tristan Gray singled to right, but Santillan faced the minimum in the frame after picking Gray off of first. The 20-year-old got out of a leadoff baserunner situation an inning later. After Josh Lowe walked to open the fourth, Santillan got Robbie Tenerowicz to roll into a double play. Santillan then pitched around a two-out walk to Kevin Padlo in the fifth before retiring the side in order in his last inning. "He just kept the ball down," Gutierrez said. "I think the couple times they did get on, one inning we were able to get the double play out of it. He just made the right pitch to get that guy to hit the ball down. Get the ball down, everything low and away, and when you're pitching like that and using your slider and your fastball and your changeup, you're going to be tough to beat. "His slider is real good. He threw it to righties, had a real hard, sharp one going, and it was tough to pick up. That's why he had all their hitters off balance." The Tortugas got Santillan into the win column on RBI singles by Luis Gonzalez and No. 9 Reds prospect Tyler Stephenson in the bottom of the sixth. "He's our No. 1," the manager said. "That's our guy we give the ball to, and we expect to play well behind him. We know he's going to keep us in the game, and the offense has to come through for him like we did tonight in the sixth inning and got him that win. He's a horse, and he's up there not messing around." Jesse Stallings closed out the victory with a perfect ninth for his first save. Stephenson's hit was his fourth of the day after the catcher went 3-for-4 with a double in the opener. "The way he carries himself, he's hard-working and never stops working," Gutierrez said of the backstop, who is batting .400/.478/.650 through six games. "He's a part of the game, being a catcher, and your first priority is the pitchers and having to handle them. He takes time doing that, and he takes time in the cages and working on his swing. I think the sky is the limit for him." Baseball's No. 43 overall prospect Taylor Trammell homered in the day's first game while No. 15 Reds prospect TJ Friedl notched a single in a pinch-hitting appearance in Game 1 and tripled in Game 2. "[Trammell] is disciplined," Gutierrez said. "For a kid to be that young and be so disciplined at the plate, it seems like every at-bat, he knows what he wants to do up at the plate. It looks like he's always trying to get his count and his pitch to hit, and he doesn't miss it. To be that young, he's very mature, a true baseball player." The Tortugas nabbed an 11-8 win in the opener over the Stone Crabs, but had to use four pitchers to get there. Lefty Jesse Adams got the nod in the bullpen game -- the first start of his professional career -- and allowed two runs on four hits in two innings. Alex Webb, Ryan Hendrix and Nick Howard covered the next five frames for Daytona with Hendrix and Howard allowing just one run over the game's final 3 2/3 innings as the Tortugas rallied for the win.